I feel obliged when doing an online order from Morrisons to browse the new items, they have a special button for it on their website, so it would be rude not take a look. This week I spotted some new own brand crisps, the most interesting sounding of which were these mozzarella and pesto variety. The crisps are fairly thinly cooked for "posh" crisps, which I actually prefer. There is correlation between thickness of crisps and the price paid. This is a bit weird, there is a lot to be said for crisps that aren't too hard and sharp. Some makes go passed ideal. These ones had a pleasing firm texture, and nice sprinkle of herby green seasoning. The flavour of these were also really good. Mozzarella and Pesto works, I've had mozzarella cheese balls coated in pesto from various supermarket deli counters, and it is a flavour combination I really love. 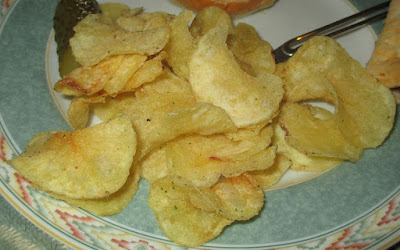 The pesto on these crisps means that these have a really herby taste, and it made them very fragrant. 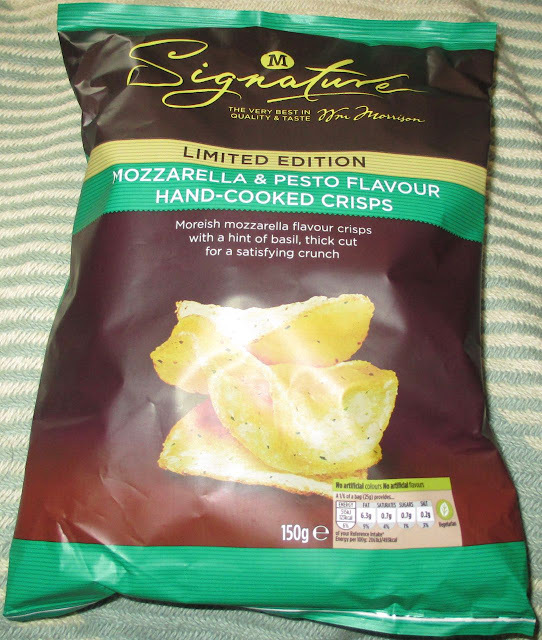 The secondary taste is the mozzarella cheese, which give the crisps a fab creamy finish. It wasn't the standard musty cheese you get with some crisps, this was delicate creamy taste. The contrast of the mozzarella and pesto flavours makes them very moreish, as the balances changes with each bite. I love the taste of basil on crisps, it gives them a lovely Italian edge.